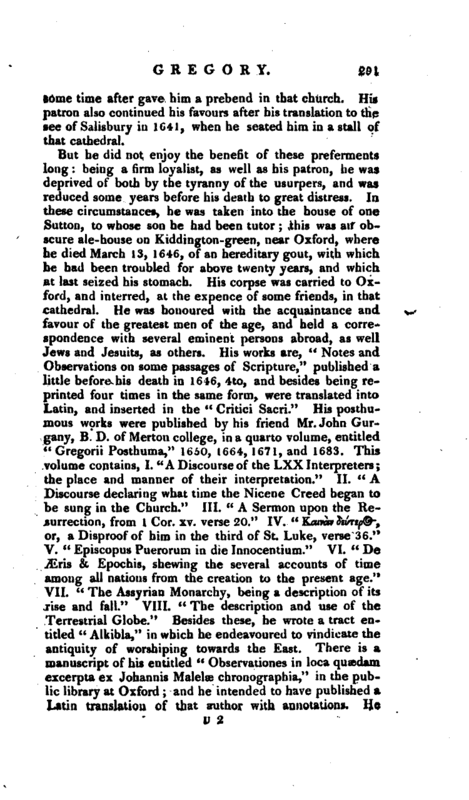 , a learned divine of a different family from the preceding, wus born November 10, 1607, at Agmondesham, in Buckinghamshire. 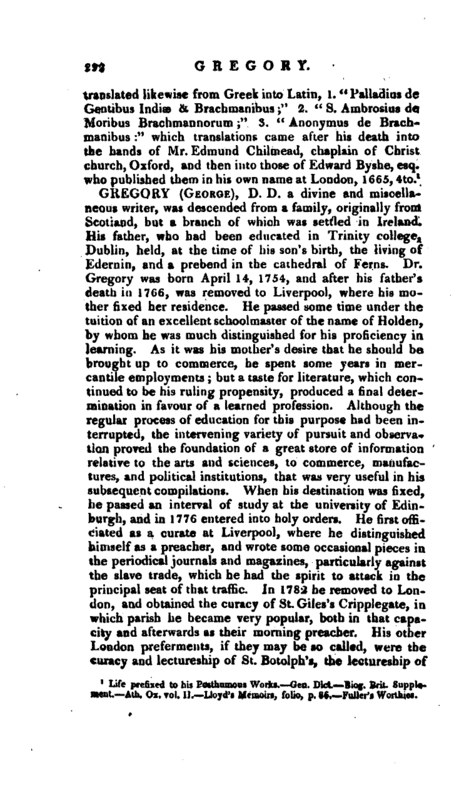 There appeared in his infancy such a strong inclination to learning, as recommended him to the notice of some persons of the best rank in the town; and, his parents being well respected for their piety and honesty, it was resolved to give him a liberal education at the university, the ex pence of which they were not able to support. To this purpose, he was chosen at the age of fifteen, by Dr. Crooke, to go with sir William Drake to Christ church, in Oxford, whom he attended in the station of a servitor, and he was soon after retained by sir Robert Crook in the same capacity; Dr. George MorJey, afterwards bishop of Winchester, was their tutor. 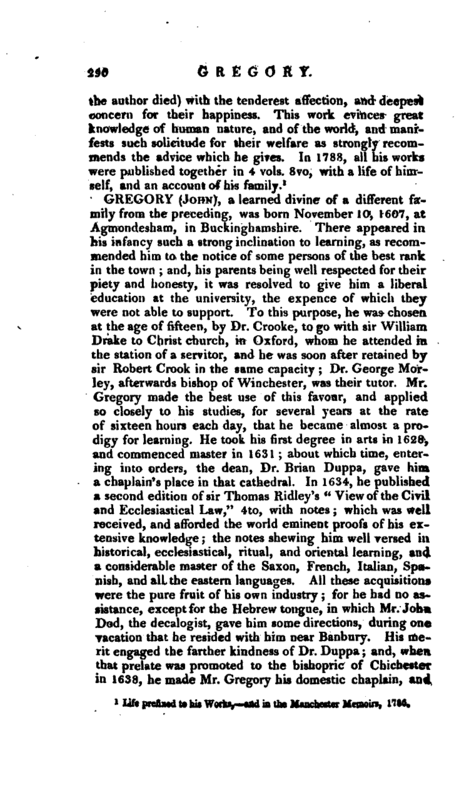 Mr. Gregory made the best use of this favour, and applied so closely to his studies, for several years at the rate of sixteen hours each day, that he became almost a prodigy for learning. He took his first degree in arts in 1628, and commenced master in 1631; about which time, entering into orders, the dean, Dr. Brian Duppa, gave him a chaplain’s place in that cathedral. In 1634, he published a second edition of sir Thomas Ridley’s “View of the Civil and Ecclesiastical Law,” 4to, with notes; which was well received, and afforded the world eminent proofs of his extensive knowledge; the notes shewing him well versed in? historical, ecclesiastical, ritual, and oriental learning, and a considerable master of the Saxon, French, Italian, Spanish, and all the eastern languages. All these acquisitions were the pure fruit of his own industry; for he had no assistance, except for the Hebrew tongue, in which Mr. John Dod, the decalogist, gave him some directions, during one vacation that he resided with him near Banbury. His merit engaged the farther kindness of Dr. Duppa; and, when that prelate was promoted to the bishopric of Chichester in 1638, he made Mr. Gregory his domestic chaplain, and | some time after gave him a prebend in that church. His patron also continued his favours after his translation to the see of Salisbury in 1G41, when he seated him in a stall of that cathedral. 1 Life prefixed to his Posthumous Works. Gen. Dict. Biog. Brit. Supply naeut. —Ath. Ox. vol. IL Lloyd’s Memoirs, folio, p. S6. Fulier’s Worthies.